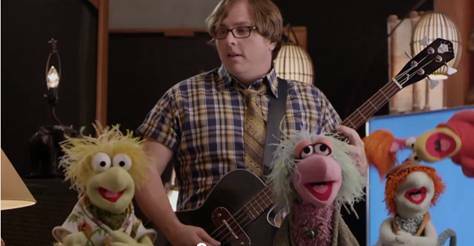 SnapCacklePop: Ben Folds Five team up with Fraggle Rock..! Ben Folds Five team up with Fraggle Rock..! Remember the Fraggles? Well at SCP it was our childhood and were surprised to see Ben Folds Five clan have team up with the muppets for their single Do It Anyway. The alternative rock band have recently reformed for their forthcoming album The Sound Of The Life Of The Mind due out September 21st. In the clip Ben Folds, along with returning band mates Robert Sledge and Darren Jessee, are joined by Gobo, Mokey, Wembley, Boober, Red and Uncle Traveling Matt with cameo appearances from Academy Award-nominated actress Anna Kendrick (Up in the Air) and Children’s Hospital comedian Rob Corddry. Check out the fun clip below & welcome back the Fraggles! Oh and Ben Folds Five..!